The Barnes & Noble leather bound collection has completely stolen my heart. The editions are all so incredibly beautiful and if money were no object I would very much like to own the entire collection. With so many classic and much loved fairy tales hidden within, this edition of Grimm's Fairy Tales would be a very welcome and treasured addition to my bookshelf. The pretty pink cover of Alice's Adventures in Wonderland & Other Stories is proving to be very difficult to resist as well! A couple of make up items I find myself looking at every so often are Warm Soul Mineralize blush by MAC that I've seen Coco from The Beauty Milk mention a few times recently. It looks really beautiful on her and I like how easy to wear it seems to be. The YSL Glossy Stain in number 17 looks like a really beautiful pink colour and I definitely want to try one of these very soon! 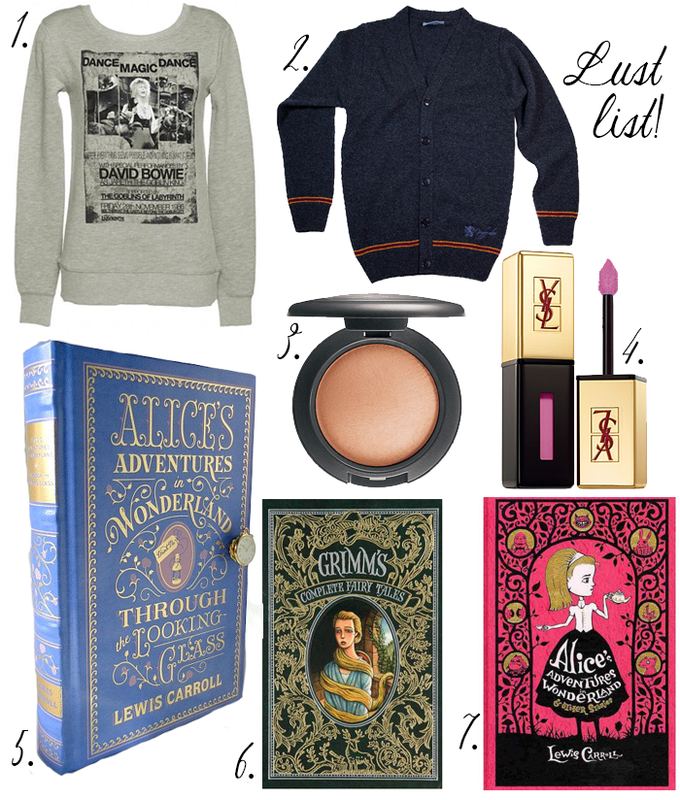 Lastly it would be a sailorjennie wishlist without a couple of knitwear items, I'm a sucker for cosy looking jumpers and literary inspired cardigans. It's been a really long time since I last watched Labyrinth, but it was one of my favourites when I was a teenager and this Labyrinth Sweater over on Truffle Shuffle is amazing. They really do have some of the best pieces, I'll have to make an order soon! I keep looking at this sweet Gryffindor House Cardigan and I so want to own one but I'm not sure if I'd actually wear it. It's lovely though! So many things I want at the moment. I need to be paid!!! those books look beautiful but i really really want that labyrinth jumper!! I've been eyeing those two books for a while too! I love the leatherbound books. They are beautiful! Loving the gryffindor cardi, but like you not sure if I would actually wear it! Oh that bag is amazing!! I have the Grimm's Fairy Tales, I haven't read very many but they're a lot of fun, very twisted :) I'd love a pretty edition of Alice in Wonderland and that Gryffindor cardi looks very snuggly indeed! Ooh, lots here to love - those books are absolutely gorgeous! Loving the beautiful books, and of course the book clutch! I really want the Gryffindor cardigan, so awesome! The MAC blusher looks beautiful, too, and really wearable. Lovely list, Jennie - you're making me want to spend more money I don't have!! ohh I have Grimm's fairy tale book haha oen of my fav to read as a kid! the color of the YSL lop gloss is so pretty! oooh the Alice book looks amazing. one of my favorite books for sure. I need that clutch in my life!! Alice in Wonderland is my favourite thing ever. A clutch in the shape of a book? I need that in my life! But unfortunately it was, so I got a second hand copy in paperback!! But it's about what's inside right? 3 is looking really really really pretty! i love those books so much theyre so beautiful i was looking at some similar only the other day! Gryffindor cardigan? Yes, how amazing?!!! I NEED ALL OF THIS. LIKE SERIOUSLY. RIGHT. NOW. The pink Alice's Adventures in Wonderland has to be the sweetest book clutch I have seen! Wow, that Alice's Adventures in Wonderland clutch is amazing! I have that edition of the book, and it's so beautiful that I'm scared to read it in case I damage it at all! the mac lipstick is SUCH a gorgeous shade! Great lust list! My absolute fav film is the Labyrinth, so as soon as I saw your blog post I just had to buy it! Thank you so much for the recommendation!